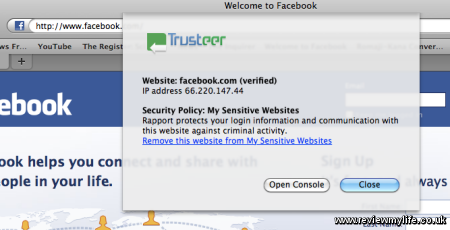 Trusteer Rapport is a piece of security software to help protect your Mac’s internet browser against key logging and phishing attacks. It is being pushed by a number of large banks including NatWest, ING and First Direct. I’ve previously written about using Trusteer Rapport on a PC , and today I’m putting up some screen shots of what it looks like on a Mac. When installed (you can download it from here you’ll get an extra icon next to your address bar. It will be green if the website is being protected, and grey if it is not. You can choose to protect a website that you log into by right clicking on the grey Trusteer arrow and clicking on ‘Protect this website’. If you click on the arrow you’ll get an information box like this which will allow you to access the console. The first page of the console should look a bit like this giving you the option to disable the Trusteer Rapport icon. 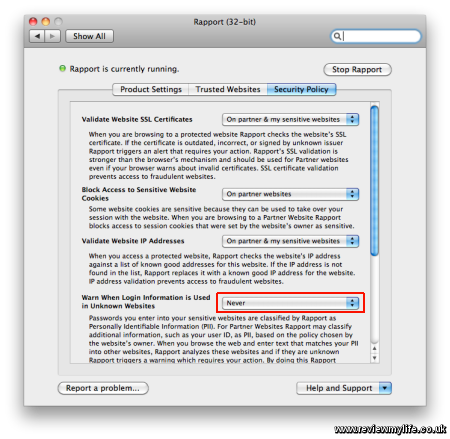 Trusteer Rapport for Mac has a lot less options than the PC version. On the security policy page all the options are set to the highest level of protection apart from the ‘Warn when login information is used in unknown websites’. If you want you can set this option to ‘On my partner & my sensitive websites’, which will give you a warning if one websites’s password is entered into another website. I have read one account of someone having problems with Trusteer Rapport on a Mac, but I’ve not experienced any problems with it on my MacBook Pro. If you do find yourself wanting to uninstall it you can get full instructions from Trusteer’s uninstall page. This entry was posted on Wednesday, September 1st, 2010 at 8:45 am and is filed under Computing. You can follow any responses to this entry through the RSS 2.0 feed. You can leave a response, or trackback from your own site.